Home - A waste mountain to climb: Can Africa make plastic recycling pay? 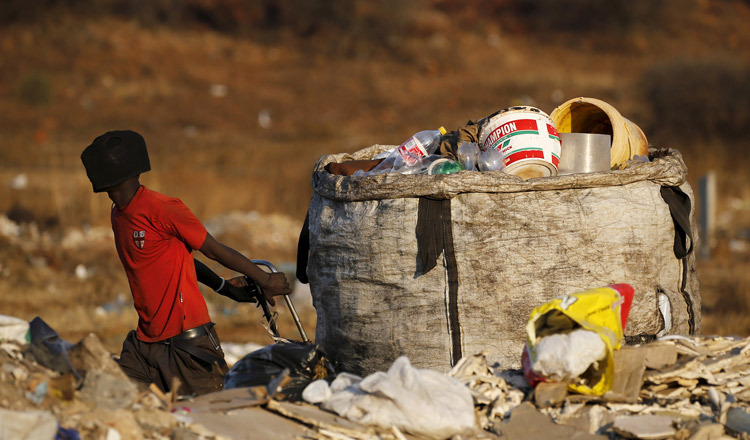 A waste mountain to climb: Can Africa make plastic recycling pay? YAOUNDE (Thomson Reuters Foundation) – Prince Djabea, 15, stamps on a plastic bottle as if squashing a cockroach, then using the heel of his other foot, flicks the bottle cap through the air with a pop. He is not showing off the latest street dance craze in Douala, Cameroon’s commercial capital, but taking part in one of the country’s biggest plastic recycling schemes striving to turn waste into something useful while cleaning up the environment. Behind Mr Djabea, about 30 teenagers gather plastic bottles clogging up drainage canals and gutters, while others go door to door asking residents for their plastic rubbish. It is all loaded into giant tarpaulin sacks that are weighed at the end of the day and then sent to be remade into shoes, chairs and floor tiles, among other products. The initiative led by RED-PLAST, brainchild of 30-year-old environmental engineer Alain Rodrigue Ngonde Elong, operates in Yaounde too, collecting 100 to 150 tonnes of plastic waste per year – roughly the weight of 55 African forest elephants. Mr Elong came up with the idea as a student in Douala. “You just saw the rubbish, the plastic everywhere you looked,” he told the Thomson Reuters Foundation, describing open drainage channels lining the streets blocked by plastic bottles. In the rainy season, the channels overflowed and attracted mosquitoes, which bred and in turn increased rates of malaria and dengue fever among local inhabitants, Mr Elong said. “No one had a solution for it,” he added. Today, Mr Elong’s team works on the problem by organising a month-long rubbish collection campaign every quarter, employing everyone from teenagers eager for work experience to street children needing fast cash. The youngsters earn on average 35,000 CFA francs ($62) per month, though their income varies according to how much they collect and the amount RED-PLAST is paid by the city council. In recent years, young activists and entrepreneurs across West and Central Africa have launched a host of creative solutions to tackle the problem of discarded plastic. In Cameroon’s coastal town of Kribi, engineer Ismael Essome builds boats from plastic bottles for fishing and eco-tourism. In Lagos, Nigeria, start-up Wecyclers runs a trash collection and recycling business, providing revenue for slum residents who gather rubbish by bicycle and are paid for the service. Further afield in South Africa, the Rethaka Foundation transforms waste plastic into school bags fitted with a portable solar-powered light to help children from disadvantaged backgrounds do their homework after dark. Meanwhile, in towns and villages across Africa, street vendors collect plastic bottles and refill them with goods to sell, from peanuts and oil to fresh juice and even petrol. Yet despite growing efforts across Africa to reuse plastic, much of the waste continues to blight local environments as litter, is burned or buried in the ground. Around the world, researchers estimate that about 8 million tonnes of plastic waste leak from land into the sea each year. In Cameroon, Mr Essome’s plastic boats have won international awards and recognition, making waves as far away as Madrid where his team was asked to construct an eco-boat. But they have received no funding from governments or charities that would allow them to expand their venture. “Because we are young and working in a new field in Cameroon, it’s a big challenge,” said Mr Essome, who is set to represent his country at the One Young World Summit for young global leaders in The Hague this month. RED-PLAST founder Elong said obtaining government funding was a slow process but the group had succeeded in securing subsidies from several local authorities, as well as income from businesses that buy the waste to make plastic products. Yet his outfit still lacks the resources to collect plastic on a daily basis which would boost results, Mr Elong added. Enterprises like his also have a mountain to climb as the amount of plastic waste is increasing. In 2010, Africa was estimated to have 4.4 million metric tonnes of mismanaged plastic waste – a figure that could rise to 10.5 million tonnes in 2025 if nothing is done, scientists warned in a study published this month. Coupled with unprecedented population growth, ballooning waste is likely to pose major problems even as local recycling initiatives multiply, environmental activists say. Osric Tening Forton, an environmental risk expert with the African Development Bank, said better regulation and stronger enforcement of existing laws are needed for private-sector recycling to flourish. The problem is not exclusive to Africa. The Organisation for Economic Co-operation and Development said in May that plastic recycling around the world is “failing to reach its full potential”. It called for the introduction of higher taxes on the manufacture and use of new plastics, and more mechanisms to make consumers pay for single-use plastic bags, cutlery and straws. Another major challenge is changing individual behaviour, said Mr Elong. “Some people tell me: I haven’t eaten for two days – why should I care about recycling plastics?’,” he told the Thomson Reuters Foundation. In response, he explains recycling can help them earn money to improve their lives, while also benefiting the environment. “At the end of the day, we need to make people understand that recycling is also profitable,” said Mr Elong.